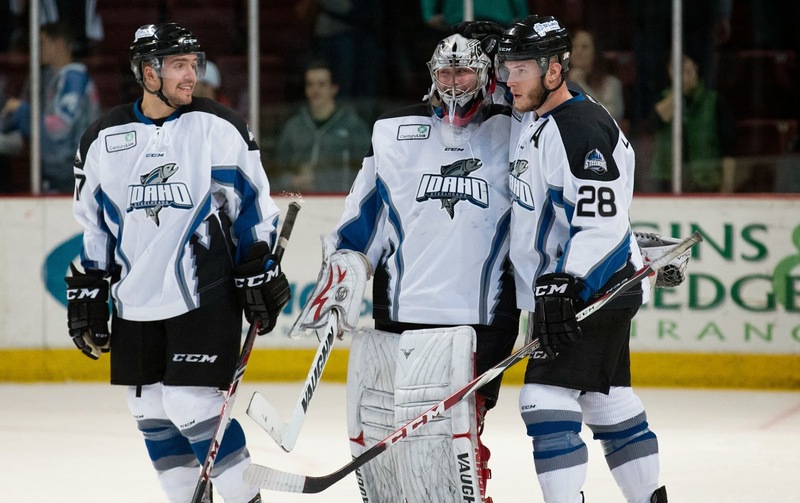 Since the last Idaho Steelheads update, which primarily focused on goaltender Jack Campbell, the Steelheads were able to run off nine consecutive wins. Seven of those wins were by more than two goals. Those wins along with a couple of losses by both the Ontario Reign and Colorado Eagles, led to the Steelheads regaining the Pacific Division lead for the past couple of weeks. The Steelheads hold a two point advantage over the Colorado Eagles, who have currently won five straight games themselves, and a ten point lead over the fading Ontario Reign. Below is a current snapshot of the top three teams in the Pacific Division. Note: teams play 72 games. The Steelheads did take an overtime loss to the Bakersfield Condors this past Monday but were able to bounce back with a convincing 5-1 win on Wednesday before heading back on the road for three more games against the Stockton Thunder. To round out the playoff picture, the Utah Grizzlies currently hold the 4th and final playoff spot with a total of 66 points, and the Alaska Aces are hot on their tail with 61 points. The Aces have currently played two fewer games than Utah. Getting back to the Steelheads, over the course of their winning and now point streak, after the win on February 14th where they defeated the Grizzlies 4-1, they would go 11 consecutive games without a multi-goal scorer. That streak ended on the 11th when both Wade MacLeod and Jason Bast netted two goals. Interesting note: it was MacLeod who had the last two goal game prior to Wednesday night. Of course going 11 games without a multi-goal scorer is something that is easily done if you are losing games 2-1 or 3-2. However, when you look at how many goals the Steelheads put up in that time, it becomes mystifying how it took so many games to get a multi-goal scorer. In those 11 games where they won nine of them and got points in 10 of them, the Steelheads scored a total of 44 goals, including games where they scored five goals twice, six goals twice, and one game with seven goals. The fact that Idaho was able to go as long as they did and still continue to win hockey games, once again speaks to the depth on this team. Wade MacLeod, Jason Bast, Alex Belzile, Josh Robinson, Colton Beck and Jefferson Dahl just to name a few, helped to pace the forwards. Shawn Boutin, Drew Baker and Matt Case helped pace the blue line scoring. It also helps when you get good goaltending to go along with deep scoring. Over those same 11 games, Idaho goaltending only allowed 24 goals which equals out to 2.18 goals allowed per game. The credit for those numbers go to Jack Campbell, Henri Kiviaho and Chris Rawlings as well as a full team defensive effort. The ECHL trade deadline was on Thursday, and the Idaho Steelheads decided to get in on the action. It took a little help from the Texas Stars to pull of the trade, but the Steelheads are welcoming defenseman Martin Lee from the Missouri Mavericks. Officially, Idaho picked up Lee for future considerations. There was a corresponding move that saw Texas recall forward Ludwig Karlsson and defenseman Troy Vance. The conversation out of Texas is that those two will be reassigned to Missouri and that will end up completing the trade. In Lee, the Steelheads are picking up a steady D-Man who has 5 G and 16 A on the season for 21 total points. All 5 of his goals have come on the power play which is a bonus. He is only carrying a plus-2 so far through the season, but when you look at how Missouri is a minus-39 in goal differential on the season, that number is pretty good. For Karlsson and Vance, this is an opportunity to get more regular time. Recently Vance has been dressing as a seventh defenseman or a tenth forward. Moving over to Missouri will give him more regular shifts. Karlsson will be able to get more time as well as he will be able to find some additional regular shifts and find a spot on the power play. Up next for Idaho is a three game in three night set against the Thunder down in Stockton starting on Friday. These will be the last three games that Idaho will play against the Thunder franchise as next year they will move up to the AHL. After that they will get some deserved time off before the Colorado Eagles come to town on March 20 and March 21 in what will be a showdown of the top two teams in the conference. Big time playoff implications from that 2 game set. They will finish out the month with three games against the Utah Grizzlies. To finish the regular season they will play one more game against the Aces, two more against the Colorado Eagles, and finish the season against the Grizzlies. John Mulhern is the arena emcee for CenturyLink Arena, home of the Idaho Steelheads, and does on-air work for the Steelheads broadcast in addition to his own Two Sports Nuts podcast. You can also follow John on Twitter @mulhern4.